Every week, the SixEight Food Pantry serves an average of 100 households. We are very fortunate to be able to send our clients out of here with so much food that they’ll need a wagon to be able to get it to their car! As a food pantry, we want to help people take the steps necessary to be able to get on their own two feet. We love hearing stories from our clients who tell us they’ll no longer need our assistance! This drives some of the decisions we make about how we operate our food pantry. For instance, a few years ago, we made the move to have our hours of operation in the evening. Why? We didn’t want people having to decide whether they should go to work or wait in line to get food. What you may not know, is that while we serve approximately 100 households each week, we are actually a pretty small church. In fact, our average attendance is less than the number of clients we serve. Serving 100 households is a stretch for us, but we feel it’s important to assist families in this way. 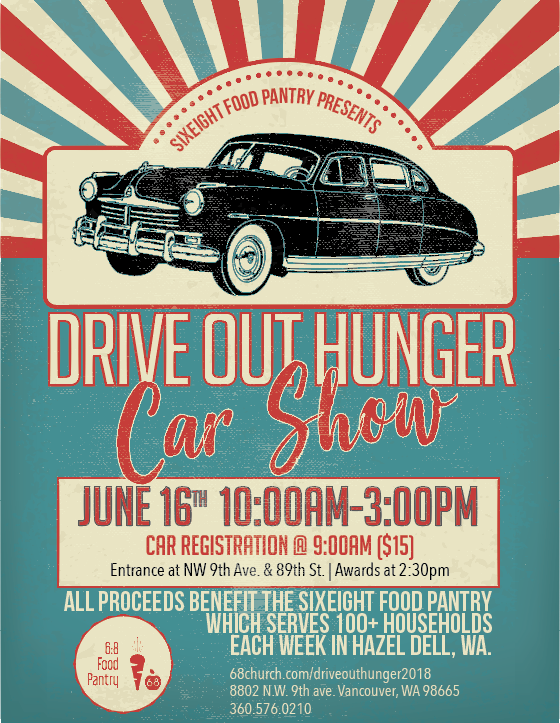 That’s why we’re doing the Drive Out Hunger Car Show on June 16, 2018. And we would be honored to have you join us! 100% of the fund raised will go to cover the costs associated with buying food through our partnership with the Clark County Food Bank, the costs of operating and maintaining the truck to haul food and to be able to do above and beyond food purchases like our annual event “Tons of Turkey” where we make sure every family that comes through the week before Thanksgiving goes home with a turkey. Do you have any questions? Contact us and we’ll get back to you ASAP!